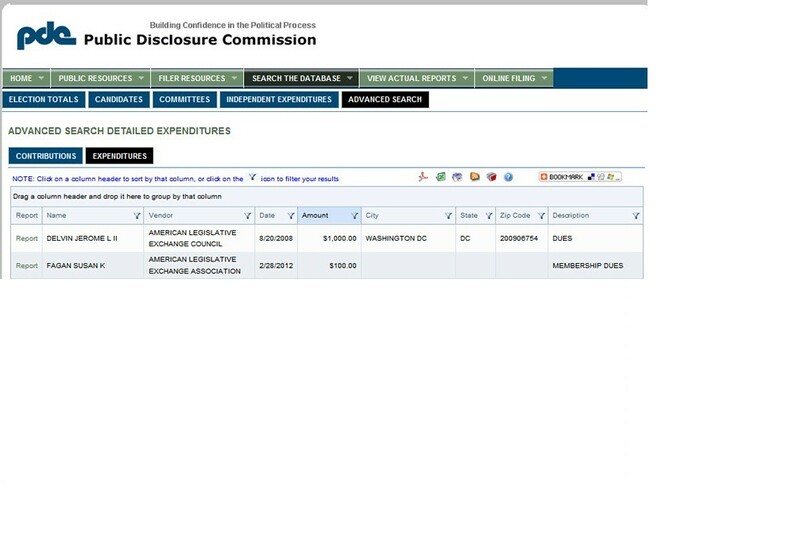 ALEC – Hidden Memberships EXPOSED! Over the past year, much information about the American Legislative Exchange Council (ALEC) has come to light. The public learned of ALEC; model legislation, secret membership lists and denial of media access to ALEC events and meetings. A complete website dedicated to exposing “everything ALEC” has been created helping to inform about ALEC. Daily Kos and VLTP Researchers have been continuously digging through thousands of pages of FOIA’s, articles and documents. These efforts have revealed some important facts involving ALEC. 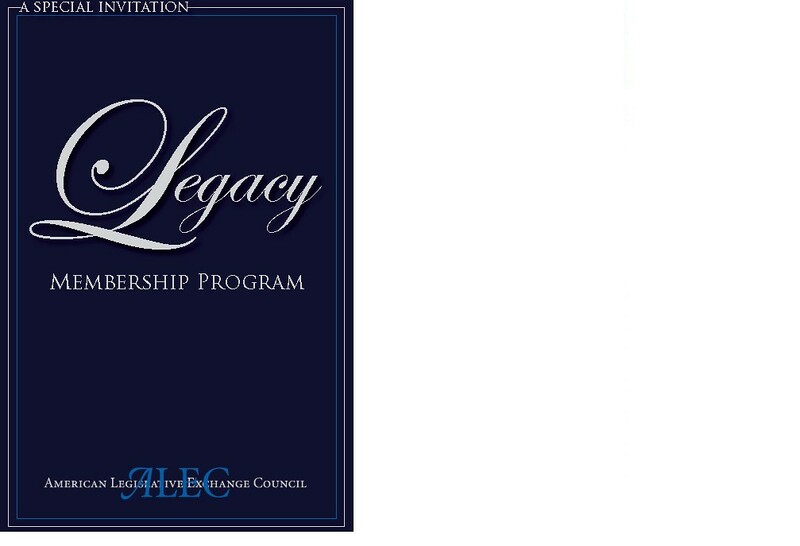 In addition to the standard Legislative and Corporate memberships, ALEC offers several additional “types” of membership; Legacy, Full and Subscription memberships. Some individuals previously thought of as ALEC “alumni” are in fact important but undisclosed card carrying members –foreign lawmakers may also hold such memberships. Section 3.03 Qualifications for Membership. Discovering that sitting Congressional members are eligible to maintain full membership in ALEC is more than worrisome, it is outright frightening with 98 known ALEC “alumni” holding seats in Congress today – without our knowing how many of those are actually ALEC members – with another 60+ Tea Party members, elected with Koch money. Finding that Governors, heads of departments and Congressional members loyal to ALEC may secretly be a lifetime member was unexpected and disturbing. The very real possibility that foreign politicians also have the ability to hold full memberships in ALEC and discuss and contribute to the development of laws implemented at any level in the U.S., sends my level of concern off the scale. Most of us have the belief that our U.S. State Department is the agency responsible for foreign policy determinations. We were unaware that ALEC was involved in helping set U.S policy by giving foreign nations a voice in our legislative processes. Identifying individuals with full membership in addition to current serving state legislators is difficult to obtain. We are still researching this particular style of membership. It is suspected foreign members with ALEC memberships include Roger Helmer and/or Liam Fox from the UK (both MP’s with Fox being the former Minister of Defence that resigned due to the ALEC/Atlantic Bridge Charity scandal). Roger Helmer is a frequent attendee and speaker at ALEC functions. “In 2003, Fox and Werritty officially partnered with the American Legislative Exchange Council (ALEC) to form the Atlantic Bridge nonprofit. The relationship flourished; ALEC supplied staff to the Atlantic Bridge, and Fox and his associates frequently spoke at ALEC events, which are comprised of meetings between American politicians and business lobbyists. But with the implosion of the Atlantic Bridge, which has already ensnared lobbyists for Pfizer and several defense firms, the controversy has brought ALEC into the limelight. “Disguised…organization” was a curious choice of words for Fox, but appropriate. The discovery that ALEC had an affiliated organization in the UK which had been cleverly hidden and disguised for eight years was unknown to most. 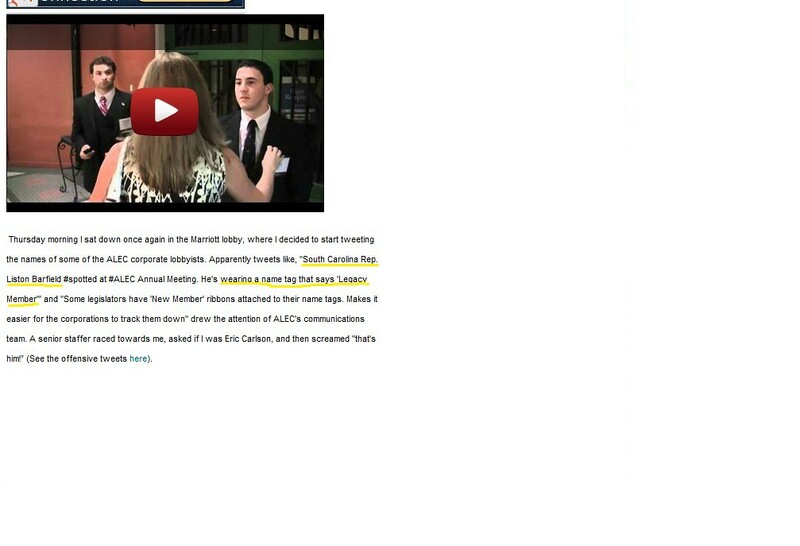 The UK scandal revealed the affiliation between the Atlantic Bridge and ALEC “Charities”. 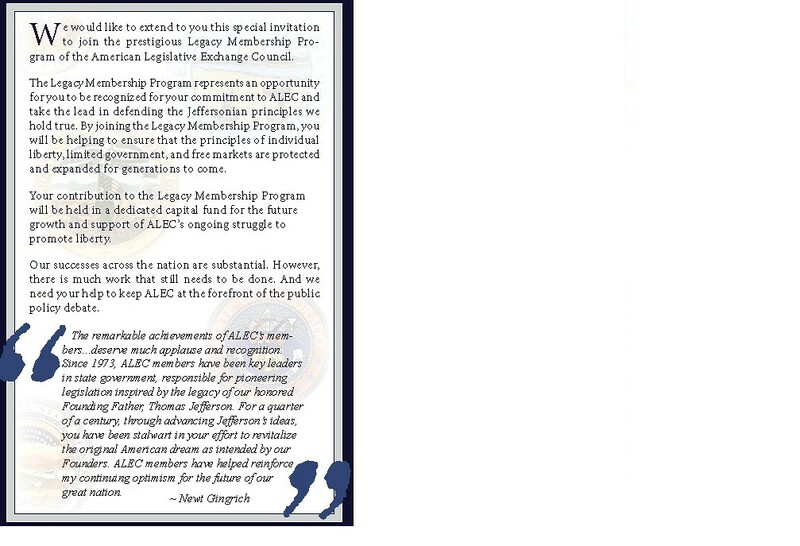 The second less known ALEC membership is called “Legacy” (or lifetime). 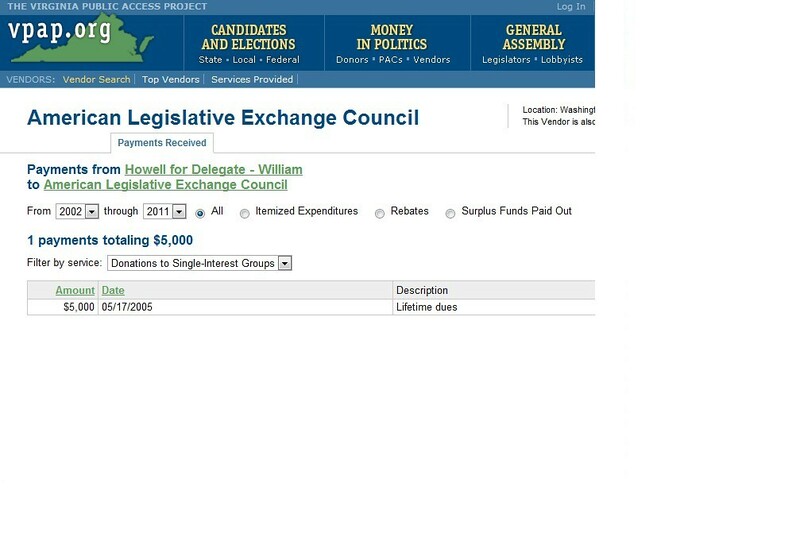 This option is also available to current or former ALEC members and at least one former state lawmaker holding a legacy membership is now working on behalf of an ALEC Corporate member (see: Drozda below). • Two consecutive annual payments of $2,500 ea. • Five consecutive annual payments of $1,000 ea. We’ve begun compiling a list of those holding Legacy memberships and believe Governor Nikki Haley of South Carolina holds an ALEC lifetime membership. 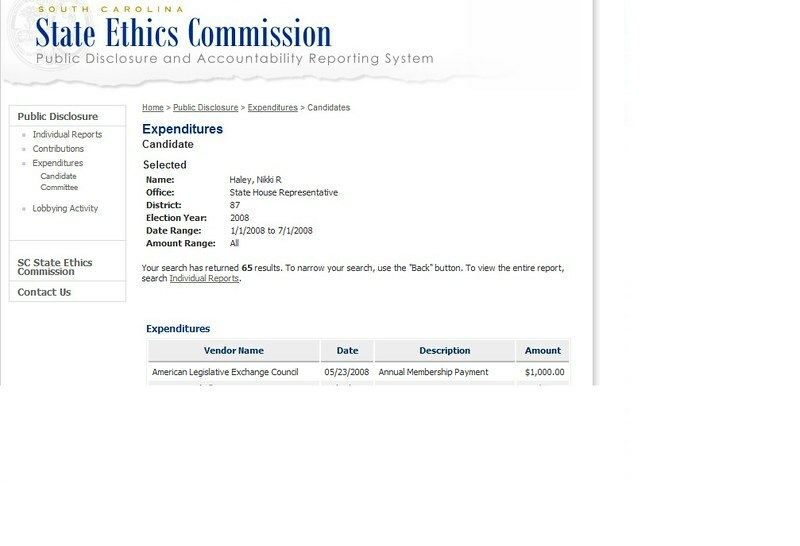 In 2008 then a SC State Rep., Haley applied for a Legacy membership by making the first payment of $1,000.00 to ALEC as reported to the S.C. ethics commission. 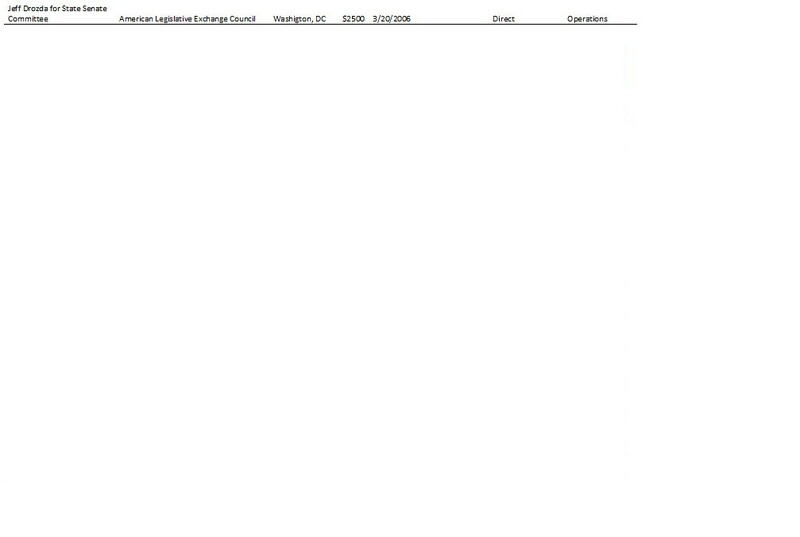 We believe the $1,000 payment listed by Haley as an “Annual membership payment” was for the lifetime membership. 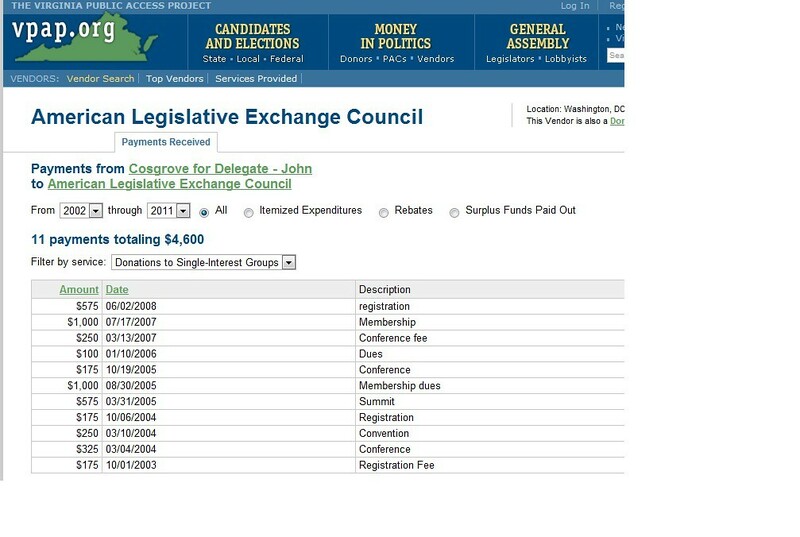 The normal annual membership fee to an ALEC state lawmaker is/was $50.00 per year paid every two years in amounts of $100.00. If Rep. Haley was not paying for a legacy/life membership, she was paying for 20 years of membership. 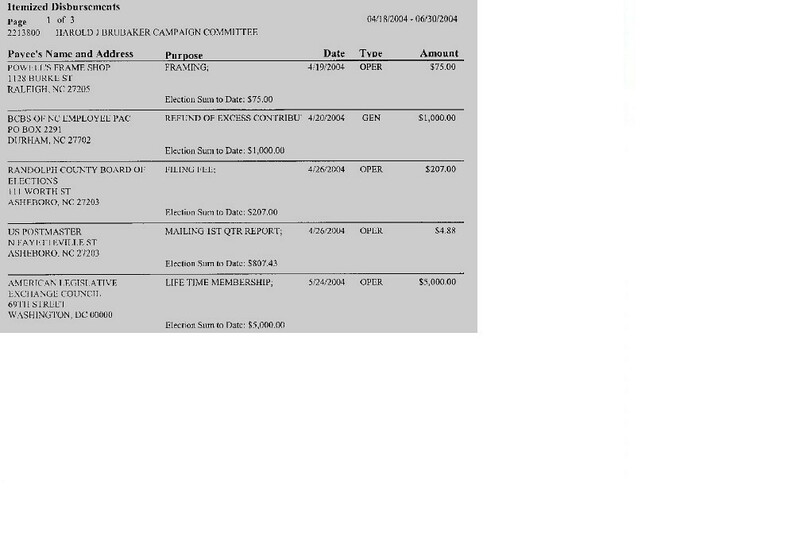 Other lawmakers paying for a lifetime membership submitted payments in the same manner as Governor Haley did. 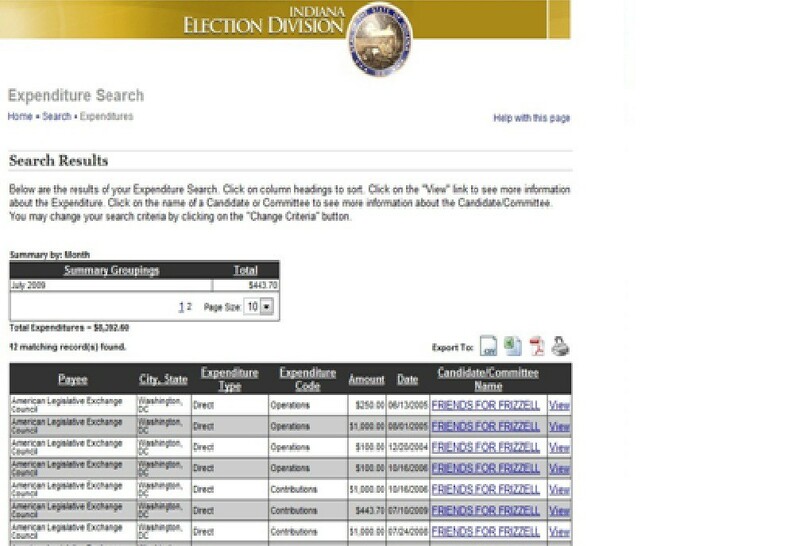 To clarify the reason for the expenditure was an installment of a Legacy membership; this author contacted the Governor’s press office and sent an email query to the Governor for explanation or comment. Both requests went without response or comment from the Governor or her representatives. I contacted Kaitlyn Buss, ALEC’s Director of Communications with a list of questions regarding the Legacy Membership program and whether or not Governor Haley had continued her lifetime membership in ALEC and/or had attended ALEC meetings/conferences since becoming governor of S.C. Ms. Buss also failed to respond to my queries or offer any response. 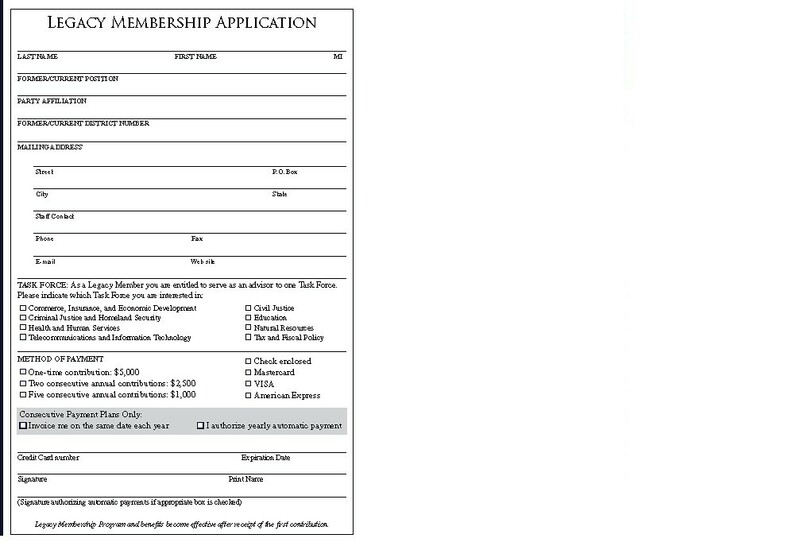 As noted in the actual application, ALEC Legacy “benefits” begin with the first installment; “Legacy Membership Program and benefits become effective after receipt of the first contribution” stated at the bottom of the application form. State Rep. Haley was an active and acknowledged lifetime member of ALEC – with all the rights and benefits available – at the time she subsequently announced her candidacy for Governor of South Carolina. 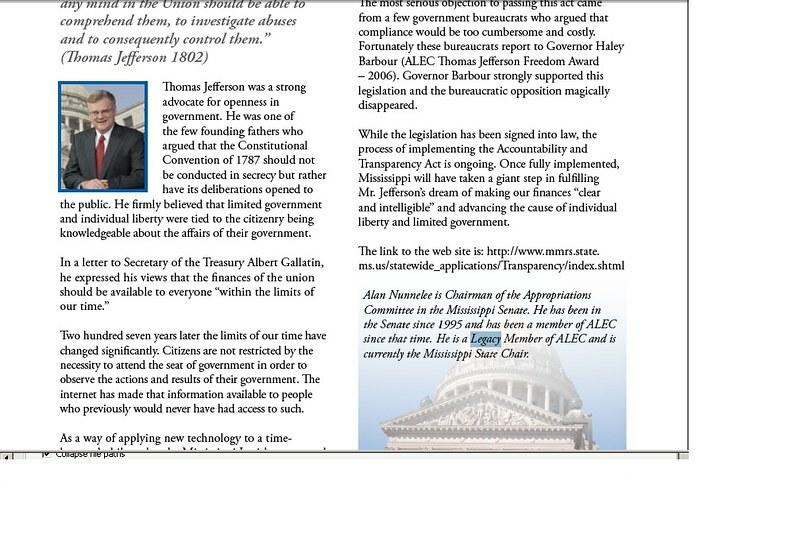 It is unknown which of ALEC’s nine task forces Governor Haley chose to become an advisor to. Possibly looking at key legislation proposed in SC by Barfield and other known ALEC members and/or signed into law by Governor Haley, will help us answer the question about whether the Governor’s loyalties are to constituents or to ALEC. • “Council on Efficient Government Act”, (S. 177). This closely resembles ALEC’s model legislation by the same name; “Council on Efficient Government Act”. This legislation is currently residing in the Senate Committee on Finance. The bill is described as: “…TO PROVIDE THE REQUIREMENTS OF A STATE AGENCY PROPOSAL TO OUTSOURCE GOODS OR SERVICES, TO PROVIDE FOR AN ACCOUNTING METHOD TO BE USED BY THE COUNCIL, AND TO PROVIDE EXCEPTIONS”. • “Voter ID” legislation of 2011(H-3003) that again closely resembles ALEC’s “Voter ID Act”, was introduced or sponsored by S.C. ALEC members (Clemmons, Barfield, Sandifer, etc.) and was passed and signed into law by Governor Haley. • Legislation “RELATING TO THE DEFINITION OF “TEACHER”, SO AS TO REVISE THE DEFINITION BY REQUIRING CERTAIN MINIMUM TIME IN THE CLASSROOM AMONG OTHER CRITERIA” (H-3018). • The legislature (through ALEC members Rep. Smith and Rep. Loftis) proposed legislation establishing the “S.C. 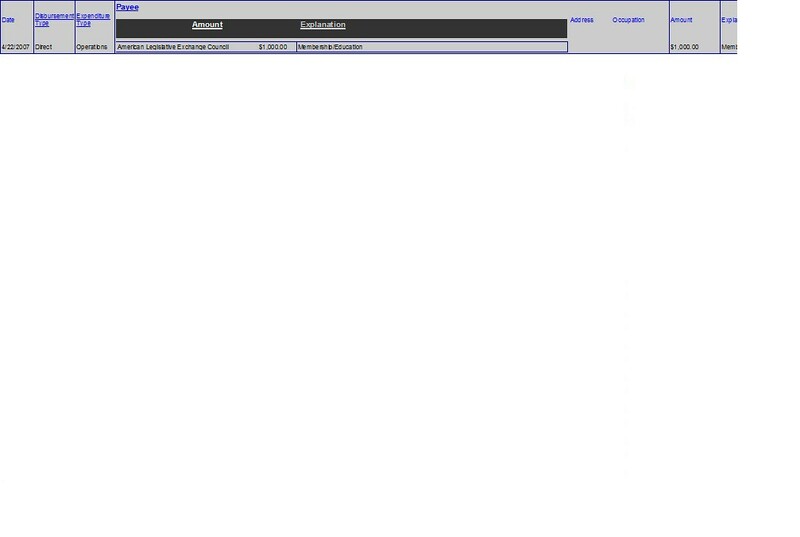 College and University Board of Regents” (H-3025). This proposed legislation would eliminate the South Carolina State Commission on Higher Education and the State Board for Technical and Comprehensive Education, replacing it with a Board of Regents. Not surprisingly, this legislation contains much of the same wording as ALEC’s “Resolution Supporting Training and Continuing Education for Higher Education Governing Boards”. • A “Private School Tax Credit” bill to provide a tax credit of $100.00 per child for purchase of books or supplies used for home schooling or attending Charter Schools. • A Constitutional Amendment to remove the Superintendent of Education as an elected post, and make that position one of gubernatorial appointment, with duties, compensation and oversight controlled by the General assembly. Repealing the Patient Affordable Care Act is also a key ALEC pursuit. If Governor Haley has maintained her lifetime membership, perhaps she’s also been quietly fulfilling her duties as well by quickly signing every piece of ALEC model legislation that lands on her desk? An even more important concern is how many other ALEC “Alum” now holding key offices are also actually loyal “lifetime” members? Kasich, Walker and Brewer are all alumni. How about Speaker John Boehner and House Majority Leader, Eric Cantor? 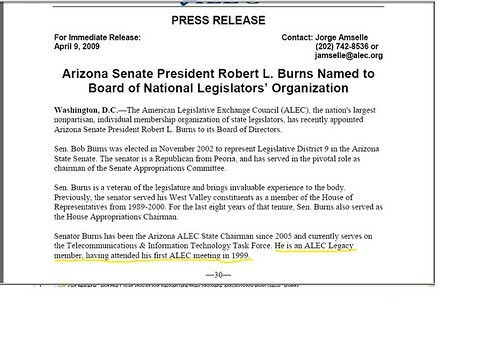 Both are known ALEC “alumni” and with the discovery of the Legacy membership program, one or both could be members while serving in the U.S. Congress. 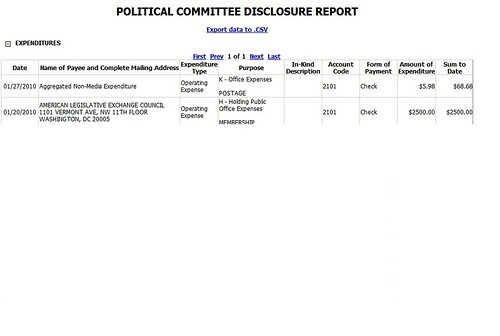 ALEC’s refusal to release any of their membership lists, forces researchers to spend hours digging out these small bits of evidence – which ALEC will neither deny or provide a “no comment” on. Rep Nunnelle is currently the only confirmed Legacy member out of 97 ALEC alumni serving in Congress. 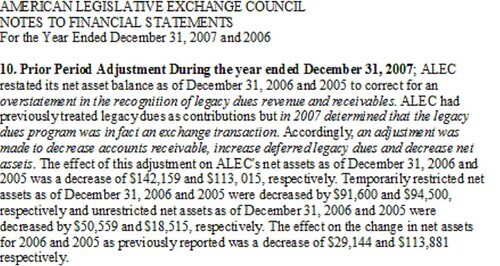 In our research we discovered ALEC made changes to their IRS 990 reporting in regard to Legacy memberships. They have been doing this since 2005, reducing the amount of accounts receivable and changing funds from legacy memberships back and forth between listing them as contributions and donations. The foregoing may explain why legacy membership payments over the years are listed differently; as contributions, operating expenses, etc. What impact, if any this could have in the ongoing IRS complaint for review of ALEC’s tax exempt status is unknown at this time. 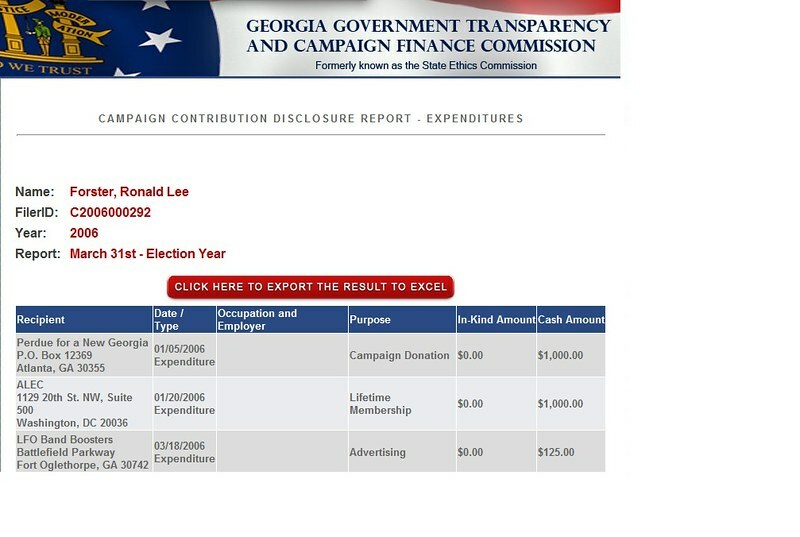 In addition to the real possibility Governor Haley’s ALEC membership may be influencing her decisions in South Carolina and Rep Nunnellee’s may be influencing his decisions in Congress; another ALEC Legacy member (Jeff Drozda) has been using his loyalty to ALEC and connections to ALEC corporate members to his – and their – benefit. After serving one full term, Drozda was reelected in 2006 then resigned midterm in 2008. While a state Senator he was employed by United Healthcare (UH – a division of the United Health Group, a long time ALEC corporate member/sponsor). In 2008 Drozda became UH’s Vice President of State Government Affairs and with the promotion Drozda was ordered to relocate to South Carolina. He immediately resigned his Senate post. In 2010-2011 Drozda registered with Alabama, Louisiana and Mississippi as a lobbyist for United Healthcare. In February 2012, Drozda was selected as CEO of the Louisiana Association of Health Plans (LAHP), the state trade association for the health benefits industry. The selection of Drozda was made by J Pegues, CEO of Coventry Health Care of Louisiana and president of the LAHP Board of Directors. Like UHG, Coventry is also an ALEC corporate member. UH and LAHP are working to provide privatized Medicaid services to Louisiana and Mississippi, the latter under a program titled “MississippiCAN” and so far this program is failing miserably,while generating large profits for UH and its subsidiary, Golden Rule Insurance. The foregoing example of coordination and loyalties exhibited by ALEC’s collective membership demonstrates how closely woven their interests and activities are and why ALEC corporations flourish. Low income families – as in Louisiana – are usually the loser in services when these efforts of privatization are accomplished through legislation. The remaining relatively unknown type of affiliation is termed a “Subscription” membership costing $250.00 annually. We learned that this is offered to ALEC state lawmaker members who have been selected and appointed to head a state department or agency. One corroborated case of ALEC offering such a membership to a recently appointed former ALEC member is that of Rep. Todd Snitchler, (R-OH). He was appointed by Governor Kasich (an ALEC alum) to the position of Chairman of the Ohio Public Utilities Commission (PUCO). 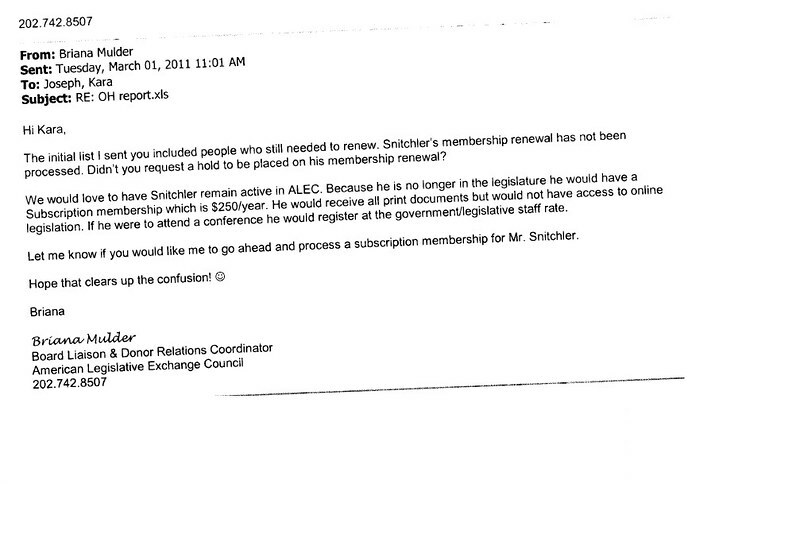 We have no documents showing Snitchler accepted the subscription membership offered by ALEC and or not. However as in the case with Governor Haley and Drozda we ascertained just how loyal Snitchler remains to ALEC’s corporate members once he became the PUCO Chairman. He favored the same ALEC member companies that contributed to his election campaigns; American Electric Power, Duke Energy. Mulder’s discussion about subscription memberships, provisions and benefits was provided so matter-of-factly, ALEC has obviously provided similar memberships before this offer was made. Again, due to secrecy surrounding ALEC memberships it is difficult to ascertain which “alumni” are instead still active ALEC subscription members – serving as directors or chairmen of important state and/or federal agencies or departments –serving in some capacity. With regard to AEP and Duke Energy we discovered in December 2011 PUCO approved a new energy security plan submitted by AEP. Simultaneously Snitchler and the PUCO Board worked with Duke Energy on another ESPfor an auction system that would determine energy – and ultimately the cost of that energy to consumers – through 2015. The Duke ESP was approved by the PUCO the same month as the AEP plan. The rate increases authorized for American Electric Power under the December ESP resulted in double digit increases in energy costs to private consumers and as high as 50% to public school customers. On February 29, 2012 Chairman Snitchler revoked the AEP energy plan by a unanimous vote of the Commission. In November 2011, ALEC members, Sen. Kris Jordan (R OH) and Sen. Seitz (R OH) sponsoredS.B. 216 that would repeal S.B. 121 requiring electric distribution utilities and electric services companies provide 25% of their retail power supplies from advanced and renewable energy resources by 2025. Governor Kasich proposed a legislative measure (S.B. 315) this past April that would allow cogeneration systems in the definition of “renewable energy resource” under Ohio’s renewable portfolio standard. Critics of the proposal have warned that the inclusion of cogeneration in the RPS could harm the development of other renewable energy systems, particularly wind. This past February, PJM filed two measures with the Federal Regulatory Commission(FERC) arising from their stakeholder process. These are designed to reform the generation interconnection process and include public policy requirements in regional transmission planning. In May, Chairman Snitchler was a speaker at the 2012 PJM Interconnection Member Meeting. PJM is a regional transmission organization (RTO) that coordinates the movement of wholesale electricity in all or parts of 13 states and the District of Columbia, serving 60 million customers. Duke Energy and AEP are both members of PJM Interconnections and PJM is a client of Shook, Hardy and Bacon (operating ALEC’s Civil Justice Task Force through Victor Schwartz as Director and Mark Behrens as Advisor). PJM, Duke and AEP have keen interests in reducing government regulations on energy, and object to the new Federal Energy Regulatory Commission’s focus on renewable energy and environment. In Ohio, an ALEC Alum Governor, ALEC influenced General Assembly and ALEC alum Chair of PUCO coordinated legislation and policies beneficial to ALEC member companies. Their actions cost customers of AEP and Duke Energy huge increases in energy costs, while generating higher profits to the ALEC companies. Whether similar manipulations are ongoing in other states, enabled by hidden ALEC members placed in key positions, is unknown at this time. But this one exposure in Ohio demonstrates exactly how ALEC members are able to impact energy pricing and regulations over an entire state – to the benefit of the corporate members of the cabal. I’m hopeful that other researchers will take the time to delve into their state records and determine whether or not this is happening in their locales. The foregoing interconnections are shown to demonstrate a paradigm operating within all levels of government; state, federal and international. All funded by major U.S. and multi-national corporations, utilizing current and former lawmakers in diverse ways to implement policies that enrich and empower. True competing small businesses, taxpayers and consumers collectively provide that enrichment and fall prey to the legislative and financial power generated through this agenda. This insight into previously unknown activities and influence through ALEC presents a clearer picture of how democracy in America is compromised through a well planned, comprehensive and highly organized and coordinated manner. With ALEC members in our legislatures, sitting as Governors, Congressmen and as heads of key state departments – such as education and energy – critical systems and services are completely compromised. When corporations have lawmakers writing favorable legislation, governors signing those into law and heads of government departments and regulatory agencies all serving under the ALEC “flag”, consumers are continuously at risk of exploitation – as we’re now experiencing in Wisconsin, Ohio, Indiana and several other states with GOP “Super majorities”. There are certainly many more Legacy and Subscription members yet to be identified and reported. 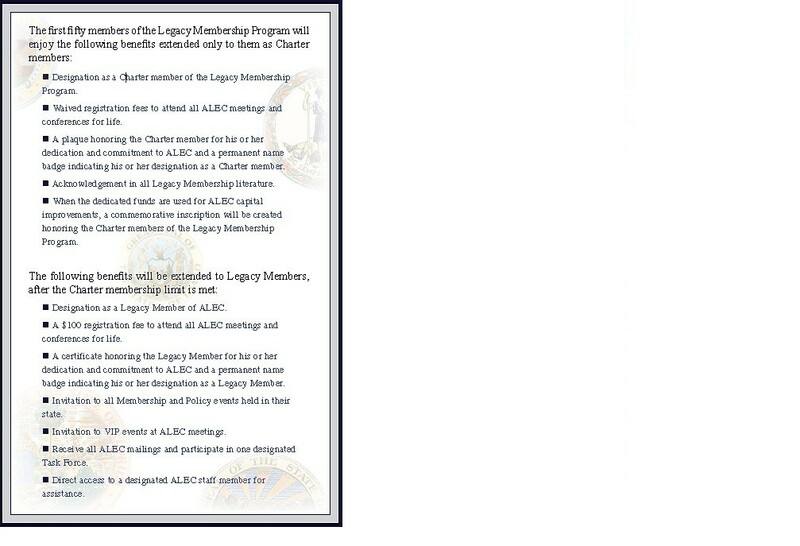 The foregoing list combined with the actual Legacy brochure and ALEC documents, establishes for a certainty the existence of these types of memberships within ALEC. The legislation presented, passed and signed into law by GOP Governors demonstrates clearly the power and influence wielded by ALEC members nationwide – used to advance a pro-corporate agenda. I want to include the great work of other DK Abolish ALEC members who participated in the research used to compile this expose; MNDem999, Ron1951, Hector Solon and the cooperative efforts of the Center for Media and Democracy. We tried to provide the tax information to a member of Common Cause in DC so it could be looked at in regard to their IRS complaint about ALEC’s tax exempt status. Our phone call was not returned.